If you’re in Westport CT, or within day-trip distance, you might want to check out the Mini Maker Faire happening there this weekend. Being held at the Westport Library & Jesup Green, there are going to be several interesting planned events, on top of the usual gathering of makers and hackers. Local hackerspaces will be in attendance as well. Some of the planned events include a battle of the home made bands, rube goldberg events, and jam sessions with the home made bands. Check out the guest speakers as well, there are a few names there that we would love to see. 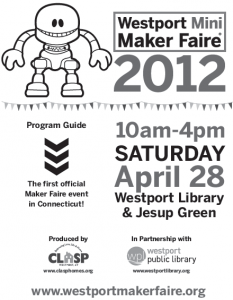 Wish my state had anything remotely close to a Maker Faire. If only I had known about this prior to today, I would have made plans to go see it. But alas, while Westport is technically within the borders of Connecticut, it is really part of the whole New York City Metro area.. I for one would not really call this Connecticuts first Maker Faire. It’s free! Online registration ended last night though. Ken Yap wrote a comment on project log The Address Decoder. jlbrian7 wrote a comment on project log Here we go again..
ekhaliul liked Auto tracking camera. Dan Maloney has added a new log for The $50 Ham: Dummy Loads. castvee8 liked The Homebrew Steampunk Laptop v2.